Most hemopoietic cells express one or more members of the Ly-6 supergene family of small glycosylphosphatidylinositol-linked proteins. Although levels of Ly-6 proteins vary with stages of differentiation and activation, their function largely remains unknown. To ascertain whether ligands for Ly-6 proteins exist, chimeric proteins were constructed in which Ly-6E, Ly-6C, and Ly-6I were fused to the murine IgM heavy chain. These chimeras specifically stained both developing and mature B lymphocytes, as assessed by flow cytometry. Analysis of variants of the CH27 B cell lymphoma revealed that Ly-6A/E and Ly-6I recognized different molecules. CH27 cells with low levels of Ly-6A/E ligand activity also lost expression of CD22, and cells transfected with CD22 gained the ability to bind the Ly-6A/E chimera and, to a lesser extent, the Ly-6C and Ly-6I chimeric proteins. As many mature B cells coexpress Ly-6A/E and CD22, the function of Ly-6 molecules may be to associate with other membrane proteins, possibly concentrating these ligands in lipid rafts, rather than acting directly as cell:cell adhesion molecules. The Ly-6 superfamily derives its name from the identification of a lymphocyte Ag that was observed on activated T cells (1). Alloantisera suggested that distinct specificities existed (2), but clarification of the Ags involved only came after the first cDNA was molecularly cloned, and subsequent genes were analyzed. The Ly-6E cDNA was originally isolated from the MethA tumor (3), and soon thereafter the cDNAs and genes for Ly-6A and Ly-6C were characterized (4, 5, 6, 7, 8). Ly-6A and Ly-6E were recognized to be alleles of the same gene, and the Ly-6A/E protein is readily detected by the Sca-1 mAb and is perhaps the most useful marker in the isolation of the long term reconstituting hemopoietic stem cell (9, 10). Recently, the gene for Ly-6I was characterized (11) and was found to be near the genes for both Ly-6A/E and TSA-1/Sca-2/Ly-6e on mouse chromosome 15 (12, 13). Most hemopoietic cells express one or more members of the Ly-6 superfamily, and the expression of Ly-6 proteins varies with development and activation (14). Ly-6A/E is present on the hemopoietic stem cell and lymphoid precursors (15, 16), but its expression must be down-regulated for T cell development to proceed beyond the double negative stage (17). CD4+CD8+ thymocytes express Ly-6I and ThB/Ly-6D, both of which are absent on most peripheral T cells. In the spleen, Ly-6A/E can be found on many CD4+ T cells while Ly-6C expression is an indicator of memory CD8+ T cells (18), and the expression of both of these Ly-6 molecules is up-regulated by T cell activation and in response to IFNs (19). Similarly, Ly-6A/E expression is down-regulated by developing B lymphocytes, which then express Ly-6I until the B cells are mature. Peripheral B cells will again express Ly-6A/E, as well as ThB/Ly-6D, and recently, terminally differentiated plasma cells have been shown to express Ly-6C (20). In addition, subsets of monocytes will express various levels of Ly-6C and Ly-6I, and granulocytes can express Ly-6C, Ly-6I, and Ly-6G/Gr-1. Ly-6 Ags have also been associated with malignancy of tumor cells (21). Given the number of known Ly-6 molecules and their apparent importance in the development and differentiation of most hemopoietic lineages, surprisingly little is known about the function of Ly-6 proteins. Exceptions are CD59, an inhibitor of the complement membrane attack complex (22, 23, 24, 25), and a distant family member, the urokinase-type plasminogen activator receptor/CD87 (26, 27). Because of their linkage to the cell membrane through a GPI moiety, Ly-6 proteins are present in membrane microdomains (28) called lipid rafts, which appear to serve as platforms for lymphocyte Ag receptor signaling complexes (reviewed in Refs. 29, 30, 31, 32). Indeed, TSA-1/Ly-6e has been shown to be physically associated with the TCR (33), and Ly-6A/E can influence T cell signaling and TCR expression (34). In contrast, T cells from Ly-6A/E knockout mice are hyper-responsive (35), suggesting Ly-6A/E may function to negatively regulate lymphocyte activation. Interestingly, the gene encoding Ly-6C is substantially inactivated in autoimmune prone mouse strains such as NOD (8). Ly-6 proteins have been proposed to act by mediating cell:cell adherence. Ly-6A/E has been reported to have a role in the cell-adhesive properties of Ly-6A/E transgenic thymocytes (36) and stromal cells (37), and Ly-6C may act as an adhesion molecule for endothelial cells (38) and splenic macrophage progenitors (39). A 66-kDa protein has been identified as a candidate ligand for Ly-6A/E (40), and although molecular characterization of this protein has not been completed, this ligand is not expressed by normal lymphocyte populations. A cell-associated ligand has also been reported for Ly-6d (41), but its existence is controversial (42). To discover whether cell surface ligands for Ly-6A/E, Ly-6C, and Ly-6I were present on lymphocyte populations, chimeric proteins were generated in which each of these Ly-6 molecules was fused with the IgM heavy chain. A similar strategy was used by Reinherz and colleagues (43) to detect low affinity interactions between CD2 and CD58. We report here that ligand activity was detected on B cells and myeloid cells, and CD22 is the B cell protein responsible for binding the Ly-6A/E chimera. C57BL/6 mice were bred and maintained in a pathogen-free environment at Yale University School of Medicine (New Haven, CT). Spleen and bone marrow were isolated from animals at 4–10 wk of age. Cell lines were maintained as previously described (11). CH27 and COS-7 cells were cultured in IMDM. CH27 variant cell lines were generated by cell sorting on a FACStarPlus (BD Biosciences, San Jose, CA) in PBS containing 10 μg/ml ciprofloxacin (U.S. Biological, Swampscott, MA) and 2.5 μg/ml fungizone (Life Technologies, Gaithersburg, MD) to maintain sterility. CHO cells were cultured in MEMα containing nucleosides (Life Technologies), and CHO cells transfected with Ly-6/Cμ were expanded in CHO-S-SFM II medium (Life Technologies). The CH2-CH4 region of Cμ cDNA was isolated by PCR using the pABμ-11 plasmid (44, 45) as template and the following two primers: forward Cμ primer, 5′-TATCCCCGGGAGTCGCAGAAATG-3′; and reverse primer, 5′-GCCGAATTCAATACGAGGTCCCGCCTGT-3′. The XbaI and EcoRI sites used for subcloning are underlined as well as the V codon (GTC) that is the beginning of the CH2 domain. To obtain the Ly-6E/Cμ chimeric cDNA the Ly-6E EcoRI-BamHI (blunted) fragment derived from plasmid pcDL-SRα-Ly-6EDb, a transmembrane form of Ly-6E (46), was ligated to the Cμ XbaI (blunted)-EcoRI fragment and subcloned into the EcoRI site of pUC19. The junction between the Ly-6 and Cμ sequences is therefore GGG ATC CCG GGA GTC; the triplets indicate the translational reading frame. The EcoRI fragment was then transferred to pFRSV-SRα. To obtain the Ly-6C/Cμ chimeric cDNA, the EcoRI-NcoI (blunted) fragment from the Ly-6C.2 cDNA (5) was substituted in the above cloning strategy and subcloned directly into pFRSV-SRα. To obtain the Ly-6I/Cμ chimera, a PCR product was subcloned directly into the XbaI site in Cμ that was designed to maintain the reading frame (11). The oligonucleotides used to generate the Ly-6I fragment, with the EcoRI and XbaI sites used for subcloning underlined, were: forward primer, 5′-CGCGAATTCTCGAGCTGCAGCCAGGTCTGAGAGGC-3′; and reverse primer, 5′-CGAGCTCGAGCCCCGGGGACCCGCGCGGAACCAGGGAGCTGCCTCCAGTGGG-3′. The CD59/Cμ construct was generated by ligating a PCR-synthesized EcoRI-XbaI fragment containing the Myc-tagged leader sequence of human CD59 extending to codon 78 (22, 47) with the same XbaI-EcoRI Cμ fragment described above. The human CD59 reverse primer was 5′-CGAGCTCGAGCCCCGGGGATCCGCGCGGAACCAGACCATTTTCAAGCTGTTC-3′. The plasmids were transfected into either murine S194 B cells (Ly-6E/Cμ) or CHO cells (Ly-6C/Cμ, Ly-6I/Cμ, CD59Cμ) by electroporation and selected initially at 50 nM methotrexate (Calbiochem, San Diego, CA) as described previously for other cell lines (48). Production of Ly-6/Cμ proteins by CHO cells could be amplified up to 10-fold by two additions of 100 μM Vectrase P (BioVectra, Prince Edward Island, Canada) at 5 and 2 days before harvesting the supernatant. Culture supernatants from each of the Ly-6/Cμ-expressing clones were collected and passed over anti-IgM columns consisting of goat anti-mouse IgM (μ-chain specific) coupled to agarose (Sigma, St. Louis, MO). Individual columns were used for each reagent to prevent any cross-contamination. After extensive washing with PBS, the Ly-6/Cμ proteins were eluted from the columns with 0.1 M glycine and 0.9% NaCl, pH 2.7, into tubes containing 1 M Tris, pH 7.2, to immediately neutralize the elution buffer. The reagents were concentrated and dialyzed using spin columns with a 100 kDa Mr cut-off (Vivascience, Westford, MA). The chimeric proteins were dialyzed to 0.1 M NaHCO3 pH 8.3, at 100 μg/ml for biotinylation. N-hydroxysuccinimidobiotin (Sigma) at 1 mg/ml in DMSO was mixed with the reagents in a ratio of 90 μl NHS-biotin/ml reagent and incubated for 4 h at room temperature. The Ly-6/Cμ reagent was then dialyzed to PBS containing 0.1% azide again using spin columns. Biotinylation of the reagents improved sensitivity in flow cytometric analysis by increasing fluorescence while decreasing the nonspecific staining often observed with other secondary reagents. The concentration of the reagents was estimated by ELISA in which the Ly-6/Cμ proteins were captured by plate-bound, donkey anti-mouse IgM and detected with alkaline phosphatase-conjugated, goat anti-mouse IgM (Jackson ImmunoResearch, West Grove, PA). Mouse IgM myeloma MOPC104E (Sigma) was used as the protein standard. The Ly-6 portion of the chimeras was detected with biotinylated Sca-1 or HK1.4 Abs, followed by streptavidin-alkaline phosphatase (Life Technologies), or with the rabbit anti-Ly-6I antisera previously described (11), followed by donkey anti-rabbit IgG alkaline phosphatase (Jackson ImmunoResearch). Abs recognizing CD11b, CD16/CD32, CD21/CD35, CD19, CD22, CD24, CD40, CD44, CD45, CD72, CD80, CD86, Ly-6G, and H-2Kk were purchased from BD PharMingen (San Diego, CA). Fluorochrome-conjugated goat anti-IgM was purchased from Jackson ImmunoResearch, while Abs to Ly-6A/E (Sca-1), Ly-6C (HK1.4), and Iak (M5/114) were prepared from hybridoma culture supernatants. For ligand detection, cells were incubated with the chimeras for 1 h at 4°C in the presence of 5% normal rat serum (Jackson ImmunoResearch), followed by one wash with PBS containing 5% FCS. Cell surface binding of biotinylated Ly-6/Cμ proteins was then detected with streptavidin conjugated to either PE (Jackson ImmunoResearch) or CyChrome (BD PharMingen). The cells were washed once more before analysis. The negative control for Ly-6/Cμ staining was biotinylated mouse anti-TNP IgM (BD PharMingen). The cDNA for murine CD22 was isolated by PCR from a mouse spleen cDNA library (Edge Biosystems, Gaithersburg, MD) using the following oligonucleotide primers based on known sequence: forward primer, 5′-GAGAGGGAGGTCCCACCCAGACGA-3′; and reverse primer, 5′-TAGGGTCGACAACCTGAAACAGCAGCTGCTACC-3′. The PCR product was first ligated into the pCR Blunt II TOPO vector (Invitrogen), and then a HindIII/NotI fragment was directionally subcloned into the pEAK-8 expression vector (Edge Biosystems). CD22 transfectants were selected with 0.5 μg/ml puromycin (Sigma). The cDNA for mCD19 was provided by Dr. D. Fearon (Cambridge, U.K.). The cDNA was subcloned into the XbaI site of the pcDNA3 expression vector (Invitrogen) using the following primers: forward, 5′-TGAGTCTAGACTCGAGCCTGCTACCATGCCATC-3′; and reverse, 5′-AGAGTCTAGACTCGAGTCACGTGGTTCCCCA-3′ (XbaI sites are underlined; the last 18 bases of each primer are specific for CD19). Whether Ly-6 proteins function in intercellular activities such as cell:cell adherence or intracellular activities such as signal transduction, each Ly-6 family member probably binds some cell surface ligand. To detect such ligands, soluble Ly-6 proteins were generated by joining the Ly-6 proteins to Igs that would allow purification and detection of the recombinant molecules. As Ly-6:ligand interactions were likely to be of low affinity, IgM was chosen as the fusion partner. This strategy would create multimeric structures that have been shown to detect weak interactions (43). Ly-6/Cμ chimeras were prepared by fusing the cDNA for the secreted IgM H chain regions CH2 through CH4 into the C-terminal hydrophobic sequence that encodes the GPI signal sequence of three different Ly-6 supergene family members: Ly-6E.1, Ly-6C.2, and Ly-6I.2. Each of these chimeric cDNAs was ligated into the expression vector pFRSV-SRα vector, which contains the dihydrofolate reductase marker. These constructs were stably transfected into CHO cells and amplified with methotrexate, as previously demonstrated (48). To improve production, the constructs were also transfected into the murine plasmacytoma S194. Higher yields were only obtained for the Ly-6E/Cμ construct. Therefore, chimeric proteins were isolated from the supernatants of Ly-6E/Cμ-transfected S194 cells and from Ly-6C/Cμ or Ly-6I/Cμ-transfected CHO cells. The Ly-6/Cμ reagents were purified on anti-IgM columns, and the concentrations of purified proteins were determined by an anti-IgM ELISA, using purified mouse IgM as a standard. Each fusion protein was also analyzed by an ELISA in which anti-Ly-6 Abs were used to detect the presence of individual chimeras (Fig. 1⇓). Each chimera reacted with both anti-IgM and only one anti-Ly-6 Ab, indicating that Ly-6/Cμ transfectants were able to secrete intact fusion proteins. Ly-6/Cμ chimeras are recognized by specific anti-Ly-6 Abs. In an ELISA, purified Ly-6/ECμ (▨), Ly-6C/Cμ (▪), or Ly-6I/Cμ (▦) at 100 ng/ml was captured with plate-bound donkey anti-IgM Ab. The bound chimeras were then detected with mAbs against Ly-6A/E (Sca-1; left) or Ly-6C (HK1.4; center) or with a rabbit anti-Ly-6I polyclonal Ab (right). In an attempt to detect ligands for these three Ly-6 molecules, the Ly-6/Cμ chimeras were used to stain a variety of normal cell populations by flow cytometry, but weak and variable reactivity was observed. To improve sensitivity, the chimeras were conjugated with biotin. Biotinylated Ly-6/Cμ reagents had the added advantage that they could be used to detect possible ligands in mixed lymphocyte populations in which IgM+ B cells were present. In fact, these reagents reacted with B lymphocytes from both bone marrow and spleen (Fig. 2⇓). Each of the three chimeras stained all CD19+ bone marrow cells (Fig. 2⇓, center panels). While staining with the Ly-6E/Cμ chimera was slightly higher on splenic B cells, the reactivity of the Ly-6C/Cμ and Ly-6I/Cμ proteins was the same or even slightly decreased on splenic B cell populations (Fig. 2⇓, right panels). Ly-6I/Cμ stained at least 95% of total B lymphocytes in the spleen, but Ly-6C ligand activity was weaker or undetectable on 15% of the B cells. Ly-6/Cμ chimeras bind target molecules expressed by B lymphocytes and some myeloid cells. Cells from the bone marrow (left and center columns) and spleen (right column) of a C57BL/6 mouse were stained as indicated with purified and biotinylated Ly-6/Cμ chimeras at 1 μg/ml or with a control IgM protein. Cells were costained for CD11b (left) and CD19 (center and right). Subpopulations of whole bone marrow positive for an Ly-6A/E ligand or Ly-6C ligand are shown. In this representative experiment Ly-6C/Cμ stained 45.8% of the total splenocytes, while Ly-6I/Cμ stained 53.3% (85 and 96%, respectively, of all CD19+ cells). Further differences in the reactivity of these reagents can be seen with myeloid cells in the bone marrow (Fig. 2⇑, left panels). Ly-6I/Cμ stained only CD19+ B lymphocytes in the bone marrow, but Ly-6E/Cμ and Ly-6C/Cμ bound to separate subsets of CD11b+ cells. While an Ly-6C ligand was present on a small population of CD11blow cells (4.4% of total bone marrow in the experiment shown in Fig. 2⇑), Ly-6E/Cμ recognized a ligand present on a larger fraction of cells that also expressed higher levels of CD11b. All three Ly-6/Cμ reagents weakly stained CD11b+CD19− cells in the spleen, but no definite subpopulations were observed (data not shown). The ability of the Ly-6/Cμ fusion proteins to detect ligands on certain cell types and common cell lines but not others is summarized in Table I⇓. None of the chimeras reacted with T lymphocytes, either mature T cells in the spleen or developing cells in the thymus. Similarly, T cell lines were negative for ligand activity. In fact, only B cell Ag receptor-positive B cell lymphomas expressed ligand activity for these three Ly-6 molecules, while plasmacytoma cell lines were negative for Ly-6 ligand expression. 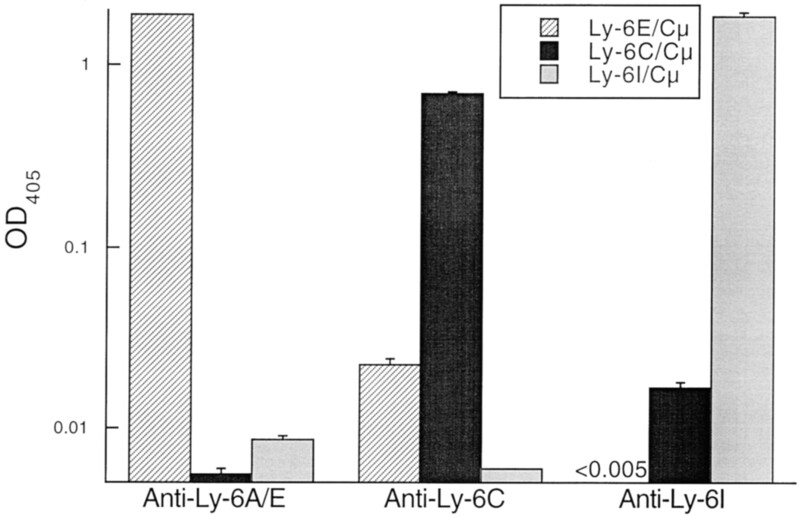 With the exception of a subset of splenic B cells, none of the Ly-6E ligand-positive cells expressed Ly-6A/E itself. Most Ly-6A/E+ cells (e.g., splenic T cells) did not also bind Ly-6E/Cμ, indicating that it is unlikely that Ly-6A/E self-associates, as previously suggested (36). Using Ly-6/Cμ chimeras as probes, B lymphocytes were identified as the best source for Ly-6 ligand activity (Fig. 2⇑ and Table I⇑). To determine whether the observed staining was due to one ligand or three different ligands, cell lines lacking Ly-6E ligand and Ly-6I ligand were generated by FACS sorting. CH27 cells were chosen as the starting population for three reasons: 1) it has been shown that cyclosporin-resistant variants of CH27 cells could be isolated (49), so mutant subpopulations of this cell line existed; 2) CD19− CH27 cells were observed in our culture, demonstrating that changes in cell surface markers occurred in this cell line; and 3) CH27 cells demonstrated a broader distribution of Ly-6/Cμ ligand activity than that of other B cell lines tested (data not shown), indicating that ligand-negative cells were present (Fig. 3⇓, A and C). Variants of the CH27 cell line with low levels of the Ly-6A/E ligand lose expression of CD22, but not Ly-6I ligand. Wild-type CH27 cells (A and C) or the Ly-6A/E ligand low variant (B and D) were evaluated for Ly-6I ligand and CD22 expression. A and B, Cells were stained with Ly-6E/Cμ (solid line), Ly-6I/Cμ (dotted line), or an IgM control (▪), each at 1 μg/ml. C and D, Cells were costained with Ly-6E/Cμ and anti-CD22. A and B are from a different experiment than C and D.
After three consecutive rounds of sterile cell sorting and expansion of sorted cells in culture, a CH27 variant cell line was established that demonstrated very low reactivity to the Ly-6E/Cμ chimera, but had normal levels of Ly-6I ligand activity (Fig. 3⇑B). A cell line completely negative for Ly-6A/E ligand activity could not be isolated, possibly due to cross-reaction of Ly-6E/Cμ with another ligand that preferentially recognized Ly-6I. 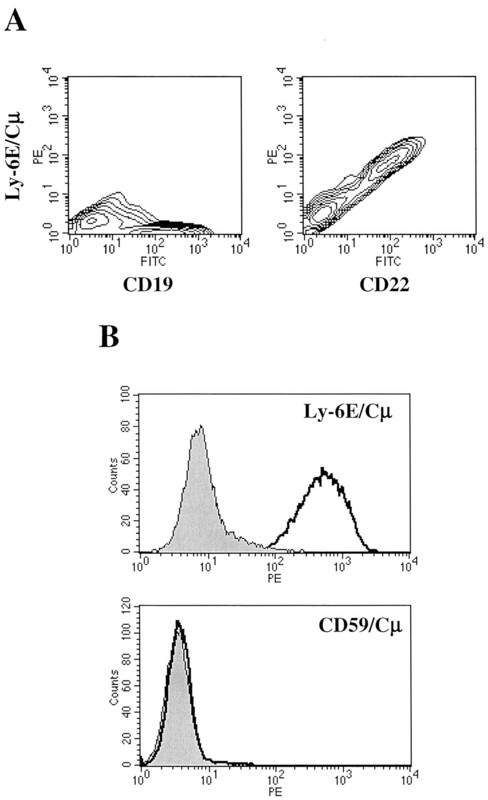 The three CH27 variant cell lines (CD19−, Ly-6A/E ligandlow, and Ly-6I ligandlow) were examined by flow cytometry for a number of B cell surface markers (Table II⇓). Some variability in the level of expression of other proteins was noted; for example, CD19− CH27 cells no longer expressed the B220 isoform of CD45. While cells with low Ly-6I ligand activity displayed relatively normal levels of all surface markers examined, the Ly-6A/E ligandlow cells lost CD22 expression. To determine whether expression of CD22 and the putative Ly-6A/E ligand correlated, a CD22− CH27 cell line was also generated by cell sorting. CD22− cells, like Ly-6A/E ligand low cells, did not lose the expression of any other cell surface protein tested (Fig. 3⇑D and Table II⇓). Thus, the ligand activities of Ly-6A/E and Ly-6I could be separated using CH27 variants, and Ly-6A/E ligand activity correlated with the expression of CD22. Ly-6C ligand activity on the CH27 variants was also unaffected by CD22 expression (data not shown). To determine whether CD22 itself was responsible for this binding activity and not some other unknown B cell surface protein, full-length CD22 cDNA constructs were generated and transfected into target cells. COS-7 cells were transiently transfected with CD22 or, as a control, CD19 cDNA. Only those transfectants that expressed CD22 were able to bind the Ly-6E/Cμ chimera (Fig. 4⇓). Although CD19 was expressed to a similar extent on the transfectants, Ly-6E/Cμ did not bind these COS cell transfectants. As a control, a similar chimeric protein was prepared in which the human Ly-6 superfamily member CD59 was fused to the same IgM sequence. This CD59/Cμ fusion protein did not bind to CD22-transfected cells (Fig. 4⇓B). Thus, cells that expressed CD22 were able to specifically bind the Ly-6E/Cμ chimera, but not a control construct. Transfectants expressing CD22 acquire the ability to bind Ly-6E/Cμ. A, COS-7 cells were transiently transfected with CD19 (left panel) or CD22 (right panel). After 3 days, the cells were costained with Ly-6E/Cμ and either anti-CD19 or anti-CD22, respectively. B, 293T cells, either untransfected (▪) or stably transfected with CD22 (□), were stained with Ly-6E/Cμ (top panel) or CD59/Cμ (bottom panel). Stably transfected cells were tested for their ability to bind each of the three Ly-6/Cμ fusion proteins. CHO cells expressing high levels of CD22 were able to strongly bind Ly-6E/Cμ (Fig. 5⇓). CD22 transfectants were also able to bind both the Ly-6C/Cμ and Ly-6I/Cμ chimeras, although their reactivity to CD22 decreased faster with lower concentrations of reagent. Taken together with the CH27 experiments (Fig. 3⇑), CD22 appears to have a higher affinity for the Ly-6E/Cμ chimera than for Ly-6C/Cμ and Ly-6I/Cμ. Similar results were obtained with CD22-transfected 293T cells (data not shown). It is unlikely that the binding of the Ly-6/Cμ chimeras is related to the sialolectin activity of CD22, given that the Ly-6C/Cμ and Ly-6I/Cμ reagents were prepared from CHO cells, which are defective in sialic acid modification of carbohydrates (50), and the Ly-6/Cμ chimeras were able to bind in the presence of serum, which blocked binding (data not shown) of an artificial substrate, 6-sialyllactose polyacrylamide (51). 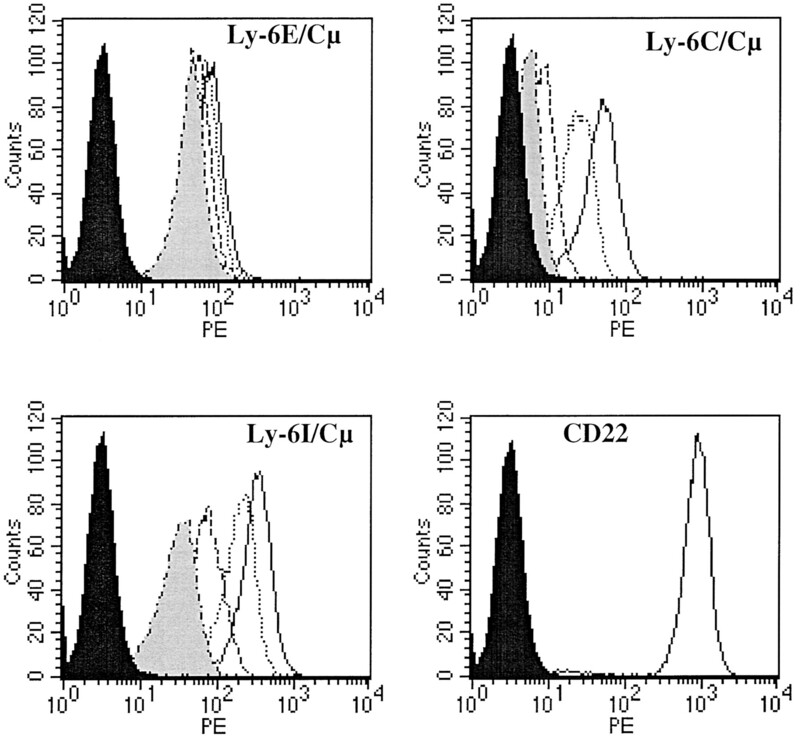 CD22 has a higher affinity for Ly-6E/Cμ than for Ly-6C/Cμ and Ly-6I/Cμ. 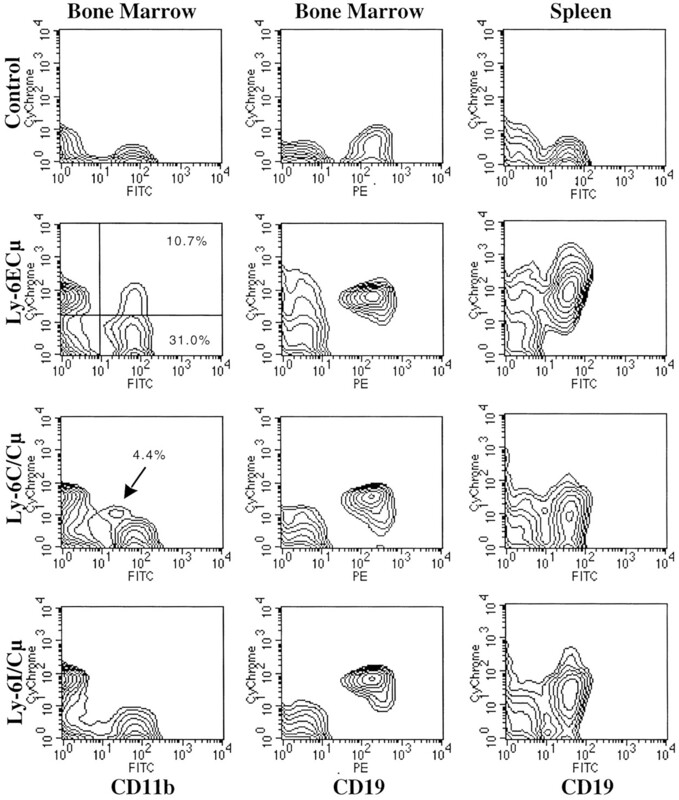 CHO cells stably expressing CD22 were stained with Ly-6E/Cμ, Ly-6C/Cμ, or Ly-6I/Cμ at 5 μg/ml (solid line), 2.5 μg/ml (dotted line), 1 μg/ml (dashed line), or 0.5 μg/ml (▦). For comparison, staining with an IgM control is shown (▪). The level of CD22 on these transfectants is also shown. Ly-6/Cμ chimeras were able to detect ligands on B lymphocytes and on a subpopulation of CD11b+ cells. 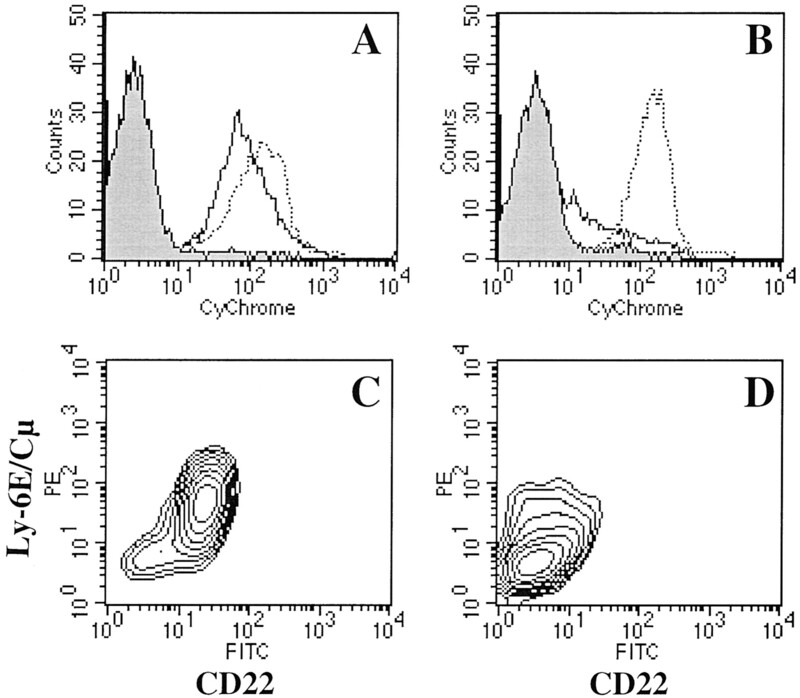 CD22 accounts for the majority of the binding of Ly-6E/Cμ chimera by B lymphocytes. The identity of a second B cell surface protein as well as that of the ligands expressed by CD11b+ cells require further characterization. Some cross-reactivity did occur, such that CD22− CH27 cells weakly bound Ly-6E/Cμ, and CD22 transfectants could bind the other Ly-6/Cμ reagents. A low level of cross-reaction would not be surprising given the high degree of similarity among these three proteins (11). Ly-6 family members are characterized by 10 conserved cysteine residues occurring at consistent intervals in the protein sequence, and the three-dimensional structural of Ly-6 proteins can be inferred from their homology to snake venom toxins (52). Therefore, the members of the Ly-6 family of proteins are likely to have very similar structures, and some cross-reaction may occur when recombinant soluble proteins are used to detect potential ligands. Using Ly-6/Cμ chimeric proteins we have detected Ly-6 ligand activity on B lymphocytes and subpopulations of CD11b+ cells. Given that the three Ly-6 molecules examined in this study are expressed (collectively) on T and B lymphocytes, monocytes, and granulocytes, other ligands may exist, but were not detected by our method. Three possible characteristics of additional ligands are discussed below. First, the affinity of the chimeric reagents for a putative ligand was below the level of detection. Thus, the Ly-6/Cμ proteins could only detect the ligands that had the highest affinity for an Ly-6 molecule. Alternatively, the expression of an Ly-6 molecule may block detection of a ligand on the same cell surface. All peripheral B cells express CD22, and when Ly-6A/E is expressed on a B cell, the two proteins may physically associate with one another on the cell surface. The Ly-6A/E soluble fusion protein may not have a sufficiently high affinity for CD22 to overcome this interaction to a detectable degree. Similar Ly-6:ligand interactions may occur on other cell types with Ly-6C and Ly-6I. Perhaps, then, the detection of CD22 binding to Ly-6E/Cμ was readily defined because the B cell lymphoma cell lines listed in Table I⇑ (e.g., CH27) do not constitutively express Ly-6A/E. Other recombinant Ly-6 molecules or alternative methods would be required to detect these low affinity ligand interactions. Second, ligands may be present on only small populations of cells at distinct stages of differentiation. For example, examination of whole bone marrow would not reveal a potential Ly-6A/E ligand on the rare hemopoietic stem cell. Similarly, DN thymocytes express Ly-6A/E at stages I and II, but these cells are a small percentage of the whole thymus. If an Ly-6A/E ligand is present only at these stages, it could have been overlooked. Ligands, like the Ly-6 molecules themselves, may be expressed after activation, but only resting, primary splenocytes have been examined to date. Certainly, immunization with Ag would be required to generate plasma B cells, which would express Ly-6C and perhaps also higher levels of an Ly-6C ligand. The presence of a ligand for Ly-6I on B cells may indicate that Ly-6I is expressed at some point after B cell activation, as mature resting B lymphocytes do not express Ly-6I. Ligand activity for both Ly-6A/E and Ly-6C was detected on small subpopulations of CD11b+ cells in bone marrow, which may represent distinct stages of myeloid development. The ligand described by Bamezai and colleagues (40) was not present in single-cell suspensions from spleen, so our studies would not have detected the 66-kDa ligand. Also, that ligand is only present on transgenic thymocytes that overexpress Ly-6A and so would not be expressed by the thymocytes examined here. A closer examination of small populations of developing or activated cells and of a broader range of cell lines would be necessary to detect these ligands. Third, the ligands for Ly-6 molecules may be soluble proteins, or soluble factors may be required for ligand recognition. CD87 is one example of an Ly-6 family member that binds a soluble protein, and recently the binding of SF20/IL-25 to Ly-6e has been reported (53). In addition, CD59 binds the complement proteins C8 and C9 deposited on the cell membrane. The Ly-6/Cμ reagents reported here would be unable to detect such ligands, so alternative methods are required to determine whether soluble Ly-6 ligands exist. CD22 shows the strongest interaction with the Ly-6E/Cμ chimera. However, we have been unable to detect significant adherence between two cell lines that are singly transfected with CD22 and Ly-6A/E, indicating that the function of Ly-6:ligand interactions may not be to mediate cell:cell adhesion. Since Ly-6A/E and CD22 would be present together on many peripheral B cells, these two molecules may associate with one another on the surface of an individual cell. In this model Ly-6A/E does not act directly as an adhesion molecule, but, rather, recruits one, resulting in a locally high concentration of CD22 in lipid rafts. A prediction would be that Ly-6A/E expression would enhance recognition of α2,6-linked sialic acid residues by CD22, an activity that has been shown to be important in self/non-self discrimination and possibly autoimmunity (54). In agreement with this hypothesis of how Ly-6 molecules may influence cell:cell adherence, both CD87 and Ly-6C have been demonstrated to activate integrin-mediated adhesion (38, 55). CD22 negatively regulates B cell receptor signaling through its three cytoplasmic ITIM domains (56, 57), and if Ly-6A/E does draw CD22 into lipid rafts, the result would be a down-regulation of B cell responses. Ly-6A/E knockout mice have hyper-reactive T cells, and mouse strains deficient in CD22 have hyper-responsive B cells. Thus, both Ly-6A/E and CD22 have been shown to be negative regulators of lymphocyte responses. Some Abs to Ly-6 proteins have been shown to cause lymphocyte activation, but this activation is a general property of GPI-linked proteins and is due to the clustering of lipid rafts by Abs recognizing raft-associated proteins. Nonactivating Abs may be inefficient at inducing raft clustering or may fail to cause dissociation of Ly-6 ligands with negative signaling elements, such as CD22. Therefore, such data cannot be interpreted to show that Ly-6 proteins directly function in cell:cell adherence or that they function in lymphocyte activation. Instead, the function of Ly-6 molecules may be to regulate the proteins that associate with lipid rafts to modulate adhesion and signaling by the Ly-6-expressing cell. Indeed, the GPI-linked monocyte marker CD14 has been shown to recruit different cell surface proteins into lipid rafts depending on whether it is unbound or bound to LPS or ceramide (58). A general property of GPI-linked Ly-6 molecules may therefore be to remodel the protein composition of lipid rafts. We thank Sally Kim and Yasuhiro Nakayama for their help in preparing the Ly-6/Cμ constructs. ↵1 This work was supported by National Institutes of Health Grant GM40924 (to A.L.M.B. ).